Mo is a retired personnel manager and now works part time for Link Connect, an internet service provider. Mo is a rock 'n' roller at heart but like Tez, embraces a wide span in musical taste. Although really a republican, she is an ardent voice in praise of the much maligned Richard III. Mo loves 19th century literature - Brontes, Jane Austen, Thackeray, Dickens, Anthony Trollope, Mrs Gaskell, George Eliot. She is also curious and has a fascination with delving into How Stuff Works. She loves sitting in her garden sipping her favourite tipple surrounded by a riot of colourful summer plants. Margaret & Mo have been friends for well over 60 years. 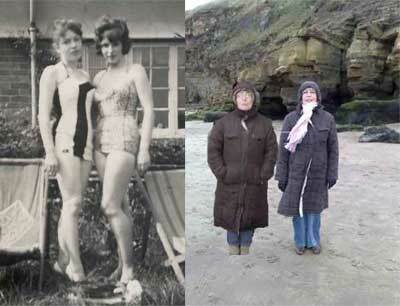 Here they are in 1960 sunbathing and 50 years later dressed for the cold! 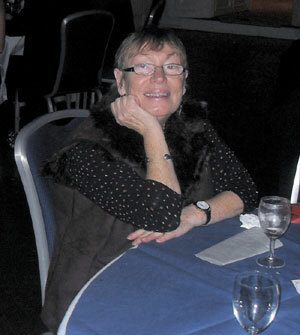 Click for Mo's Journal of her 60th Birthday Trip on the Settle & Carlisle Railway (close window to return to this page).